Old Earth Or Evolutionary Creation? Christians confess that God created the heavens and the earth, but they are divided over 'how' God did it. 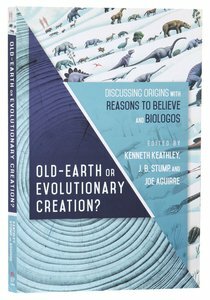 This book presents a civil dialogue between representatives of two leading thinktanks on origins - Reasons to Believe (old earth creation) and BioLogos (evolutionary creation). About "Old Earth Or Evolutionary Creation?" :Christians confess that God created the heavens and the earth. But they are divided over how God created and whether the Bible gives us a scientifically accurate account of the process of creation.Representatives of two prominent positions-old earth creation (Reasons to Believe) and evolutionary creation (BioLogos)-have been in dialogue over the past decade to understand where they agree and disagree on key issues in science and theology. This book is the result of those meetings. Moderated by Southern Baptist seminary professors, the discussion between Reasons to Believe and BioLogos touches on many of the pressing debates in science and faith, including biblical authority, the historicity of Adam and Eve, human genetics and common descent, the problem of natural evil, and methodological naturalism. While both organizations agree that God created the universe billions of years ago, their differences reveal that far more is at stake here than just the age of the earth.Old Earth or Evolutionary Creation? invites readers to listen in as Christian scholars weigh the evidence, explore the options, and challenge each other on the questions of creation and evolution. In a culture of increasing polarization, this is a model for charitable Christian dialogue.